Shipped packages and crates can carry all sorts of warning labels on them. The most common ones seen being “Breakable”, “Do not fold”, and their ilk. Today I noticed a new one on a large package delivered to our office. In very large block letters, with a colour highlight, was the sentence “DO NOT FREEZE”, and beneath it, in slightly smaller font “Sensitive Against Freeze”. I had no idea shipping companies had a tendency to freeze packages. Not to mention pretty bad grammar on the smaller sentence, but that’s beside the point. A woman was found dead in her apartment in London. Which isn’t all that rare, people do die. But this one was lying dead in her apartment for close to three years before being found. Police believe she probably died of natural causes in early 2003, and was only found in January this year when housing association officials broke into the bedsit in Wood Green, North East London. They were hoping to recover the thousands of pounds of rent arrears that had piled up since her death. So for three years nobody noticed, or cared, that she was missing. No friends wondering what happened to her and why she didn’t call them for a long long time. And apparently even the landlord was willing to wait three whole years (two if she paid a year in advance, not very likely) without at least bothering to… I don’t know… come over and knock on the door? That must be a very nice landlord. Some mail was marked February 2003, and medication and food had February 2003 expiry dates, the spokesman said. Nobody even noticed the smell coming from the apartment. Joyce Vincent was surrounded by Christmas presents and the television and heating in her bedsit were still on. The electrical company didn’t cut her power off, for three whole years? Or was she on a deal where the bank transferred the money automatically every month? In that case, it’s amazing she kept enough money in her cash account for three years’ electricity. And that the bank didn’t notice the lack of any income, and the electrical company didn’t notice the unusual usage patterns of never-varying electrical consumption. The people who gave her all these Christmas presents never wondered why she didn’t call to thank them, or invited them for Christmas the year after? Maybe all the presents were really lousy. Most of all, though, I want to know the model of her heater. Three years working non-stop, and the thing still functions? I want one. Every few years we have someone trying to drill for oil in Israel. Stories appear about how they have some new idea, new findings, new theory. Almost always they also state how unlikely it is that Israel won’t have any oil deposits while our neighbours have a lot of them (Politely ignoring that they don’t have it on every single location, and Israel isn’t that big). And, unsurprisingly, every time they fail miserably. Or at best, just fail quietly. Often they find nothing. Sometimes they claim to actually find oil, but in depth and quantities making it not worthwhile to to drill. The thing is, there’s no oil here. We don’t have any. Not in the ground anyway, just in tankers we use when buying it from abroad. No, really. Yet people insist on failing to get the hint. The plethora of hints. The whole army of them. As if geological surveys and past experience are nothing to them. This one is on the right track, though. You see, considering that there’s no oil to be found here, it will take a miracle to find any. Literally. And this group is totally on the right track for miracles. They’re not using guesswork, and hope. Oh, no. They’re using scientific methods. Mainly, they’re basing their drilling on some cryptic and obscure verses from the Bible. Yes, Biblical reference. How more scientific could they get? I sent a small package abroad this morning. On the envelope there are two marked areas, one for the sender address, and one for the destination address. Each of these has a few lines, for the different parts of the address. Very standard, has been like that for years and years. The clerk I worked with in the post office this morning isn’t a new one, she has also been there for several months, if not a few years. She knows the drill, knows her way around, and have done it all plenty of times. I wrote the addresses, both mine and the recipient’s, on the envelope. I then closed the envelope and handed it to the clerk. She then started with her part, which includes weighing the package, telling me how much it will cost, collecting the money, stamping the envelope, and sending it. Except that this time there was a slight problem. She looked at the envelope, and seemed to be searching for something. It took her quite some time. Then she turned to me and asked what country is the package for. The country name was written, in big letters, on the bottom line of the recipient’s address field. This is the usual, customary, and mandated place for it. This is the exact same place that the country name is always written on when using those standard envelopes. It should have been the first, and the only, place for her to look for the country name. And she did look. But she didn’t find. Which leaves me no option but to conclude that the girl either needs a pair of reading glasses, or needs to stop taking hallucinogens before going to work…That was just extremely odd. A delivery guy arrived today with two large packages of electronic equipment we ordered for one of our systems. One package contained the actual device, and the other contained mostly power supplies. Needless to say the electronics were somewhat gentle, though the power supplies are probably more robust. The guy requested help getting the stuff from the truck, so we took a small cart, and went over to the truck, which was parking outside on the street. He opened the trailer, and I saw that besides our two packages it was empty. The packages were not tied down, or fastened to anything. In fact, they were resting in an angle on the corner that gave the distinct impression they slid on the floor during the drive over, and this is where they bumped the trailer’s walls last. After putting both boxes on the cart, we moved back to the office. The gate out of our office was half open, a position meant to allow people to walk in, but to prevent cars from entering (Our people have remotes to open the gate, and other people really shouldn’t use our limited parking space). I told the guy that I’ll go and open the gate, and he kept saying that it’s not problem, and everything will pass. When we reached the gate, the opening was too small for the large boxes. He started rotating the cart in various angles, to no avail. Again I offered to open the gate. The guy repeated that it’s not necessary, and told me that there’s a very simple way to deal with that. And before I realized what he was doing, he nonchalantly pushed the boxes off, and they came tumbling to the ground. He then moved the cart in, and put the boxes on it again. I kid you not. And this was not some minor transporter, but one of the major international transport companies. Luckily the box that was higher on the cart, and so got the much stronger hit after the fall, was the power supplies and not the other electronic devices. What’s the difference between zero and zero? One of the various tools laying about in our office is a digital varnier caliper. 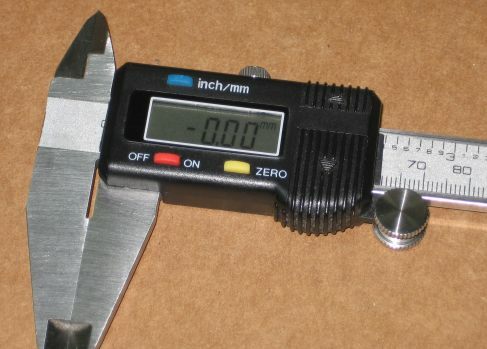 It’s a pretty handy tool when someone (usually not me, since I deal with computers, not the physical parts) wants to get exact measurement on something. Now, guess what happens when you push it a little? 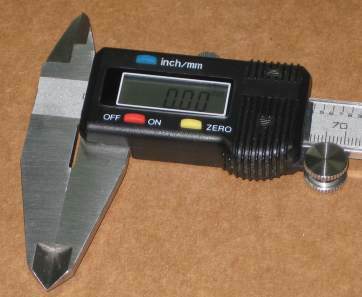 Well, obviously the designers thought about that, and the caliper can measure negative distances. Actually, you can zero it on any position, so it can in fact measure even large negative distances. This is fine, a good feature. Remember that small burglary we had in the office around early January this year? The person also left behind a bottle that he had touched. So the bottle likely has the burglar’s (My apologies to burglars everywhere who feel slighted, but I still think it’s a good term for a probably drugged hobo who breaks a window and climbs in) fingerprints on it. Meaning that the police could take it, get the prints from it, and maybe find the person responsible. The police knows that as well, which is why they told us back then to keep the bottle, and that they will arrive straight away to take it. After a few instances where we talked to them, this morning someone from the police called to let us know that he will be passing over in the area at around noon, and we should make the bottle ready for him to take. It is now evening, and we didn’t hear from him yet. All in all, very prompt and fast response time. Only about four months have passed, and they are now very close to actually getting a piece of evidence from the scene of the crime. Bravo. This is a wonderful idea, and I’m more than happy to do my little share to help publicize the Time Traveller Convention. After all, some day I’ll be very famous, and so this blog and all my posts will be remembered forever and ever for posterity (Just a second, somebody is knocking on the door… Some odd guy, looking for an Ozymandias. Foreign name… I told him he got the wrong address. Back to the post). So this is the best way to make sure all the future time travellers will notice. I can feel the future history of the world changing and reshaping as I write these words. All in all, I can think of just one reason why this may not work. Maybe they already have one, planned at a different place and location. So all the time travellers already know that this convention didn’t happen, so they won’t attend. Darn, these things can give a guy a headache. We don’t know the technology. Maybe there are limits, or external influences. What if there are too many of them? The space is rather limited, after all. Do we really expect all time travellers to be able to be friendly, and deal with each other amicably? Heck, we have people from the same time that won’t be together in the same room without trying to kill each other. So people from different times? If some of them hear about this, and know that they didn’t come, they may decide not to come. Yes, that’s the headache factor again. Remember the casino that bought the Virgin Mary Grilled Cheese Sandwich for an outlandish amount of money, on eBay? Well, turns out, they’re very eBay happy (happy as in trigger-happy) over there, and are buying odd stuff all over the place. The rights for the name of a woman, which then had to change her name to that of the casino. The names of three newborns, similar deal. the new candidates for the papacy. candidates are just TV characters. To continue the US visa stories from my previous post about my own visa, my friend needs to get a new visa. Which is a whole different ballgame. mass murderer, or anything like that. the time you have until the interview, and bring them with you. for Electronic Visa Application Forms. properly work with this site. Cool, eh? wrong. What it does, once you fill all the information on the web, is generate a PDF of the form, with the information entered written into it. You still need to print it, and you still need to take it with you. but it doesn’t quite do that. appointment is about two months. Yes, two months. lot of money that will be lost on cancellation fees. does imply that every day there are much more than a 100 people who try. you at least get an interview on the same day. My friend arrived on 5AM anyway, to see if maybe it would be enough. arriving and being turned away. should have the experience of the last several days, and so provide a decent estimate. Right? Wrong. Just to be safe, my friend arrived some time before 16:00. At least my friend has strong family ties, work, university studies, and no reason to want to live in the US, so the visa will in all likelihood be approved. America be willing.